Isn't it time to love the way you look? Dr. Michelle Yagoda is considered one of the best cosmetic facial plastic surgeons, ENT, and voice care professionals in New York City (NYC). She has been providing an integrated approach—to beauty, aesthetics, ear, nose, throat, voice, and cosmetic surgery—since 1990 in New York and Manhattan! This does not mean a bubbly fountain of river rocks in her reception area or general platitudes about “wellness.” For Dr. Yagoda, an integrative approach means taking the best of multiple disciplines and combining them to deliver patient care that’s greater than the sum of its parts. Trained in both cosmetic facial plastic surgery and otolaryngology (ear, nose and throat medicine and surgery), Dr. Michelle Yagoda is regarded as the doctor other doctors choose when they want the very best. A top female plastic surgeon for aesthetic and reconstructive surgery of the face, she is also an otolaryngologist, sub-specializing in the medical and surgical treatment of sinus disease. In laryngology, she focuses on the care of the professional voice. In all areas, she combines natural, prescription, and holistic treatments with cutting-edge laser, injectable, surgical and non-surgical techniques. Affiliated with New York’s finest hospitals, Dr. Yagoda was awarded the “Top Doctor” rating on RealSelf.com. Recognized as one of New York’s best cosmetic surgeons, she is an assistant adjunct attending physician and clinical instructor at Manhattan Eye, Ear and Throat Hospital, Lenox Hill Hospital, The New York Eye & Ear Infirmary, Beth Israel Hospital, and Mount Sinai Hospital. Her private office with operating suite is located steps from the Metropolitan Museum of Art on Fifth Avenue on Manhattan’s prestigious Upper East Side. Dr. Yagoda caters to selective, professional and celebrity clientele. She is thorough, compassionate, discreet and widely regarded as an excellent teacher and a premier plastic surgeon in New York City (NYC). Dr. Yagoda is pleased to offer Alphaeon medical financing. If you want to enhance your appearance through cosmetic surgery, dermal filler injections, or other beauty procedures, but need help with medical financing, Alphaeon can provide you with private, convenient, attractive and flexible monthly payment options so that you can get the look you’ve been dreaming of now! Michelle is the complete physician. I have known her, and her work, for over 20 years. Her commitment to the pursuit of excellence in the care of her patients is exemplary. She is an accomplished entrepreneur and has an aesthetic vision and the skills to realize it, unknown to most. Her approach to patient care provides a holistic experience to ensure their well-being and surgical success. 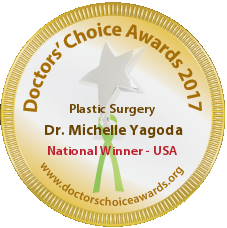 Dr. Michelle Yagoda is an innovative and skilled plastic surgeon. Her patient care is superlative, and she is a highly respected colleague. I've known Dr. Yagoda for over 25 years and can attest to her phenomenal surgical skills, her fantastic abilities as a facial plastic surgeon, and her compassionate care of all her patients. She is an incredible surgeon and a great colleague. Dr. Michelle Yagoda is a brilliant and outstanding physician and educator. It is a pleasure to recommend her to my patients and they always call me to thank me for the referral! Dr. Yagoda is a world-renowned facial plastic surgeon and otolaryngologist. Her surgical talents are impeccable. Her dedication to her patients is outstanding. She has made major contributions to the surgical community through her publications and her work with the Academy of Facial Plastic and Reconstructive Surgery. Moreover, her devotion to the care of survivors of domestic abuse speaks to her exemplary societal commitment. Beyond Beauty Blog: Surgeon’s Secrets! See this month’s promotion and join our mailing list to get special offers on skincare products and services. Get Dr. Yagoda’s newsletter with useful information, medical news, and tips for a healthy lifestyle! Sign Up for Monthly Newsletter and Promotions from Dr. Yagoda. Beauty is Power. Drink It In! BeautyScoop is Dr. Yagoda’s all-natural, clinically-proven breakthrough beauty supplement. Its unique, patented formula provides essential peptides and lipids, the body’s building blocks for nourished skin, strong nails, and healthy hair.